The Thacher slide rule needs no introduction. Around 1912 K&E took over printing the scales as well. There were two models of the Thacher, originally the 1740 (standard) and 1741 (with magnifying glass). The K&E Universal Slide rule first appeared in 1900 and was in their catalog until 1909. It was designed to solve the problem of how to put more scales on the face of a slide rule when your dividing engines can only cut scales on the edges of the stators and slides. K E SLIDE RULE 68 1210 LOG LOG DECITRIG 1947 USA. Condition is Used. Sold as is. What you see in the pictures is what you will receive. We will answer to the best of our ability. Was wrapped around an slide rule for years. OLD Dietzgen slide rule with 1904 patent mark! Case still in great structural condition and is solid. Engraving/writing on back of rule. Much of the type on back is no longer legible as shown.Actual item pictured. Very good condition plastic on mahogany rule. One can calculate easily and quickly once you learn to manipulate the slide and cursar. Like new condition, Leather case included. Laminated wood easy to use, easy to read. 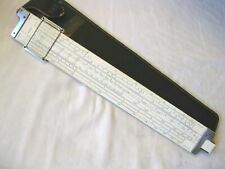 1950's Keuffel & Esser Co Beginner's Slide Rule 10" Mannheim Type. NJ in the 1950's. Excellent condition with original case. Old catalog pages and instruction manuals are in links below. See photos for more details. Very nice, slides easily, nothing missing. Has a crack in the slider plastic as shown. This is one of over 800 drafting sets and paraphernalia from 1850’es to 1950’es I will be listing over the next few months. Put me on your watch list and check them out. Pickett N-500-T, Model 4. Sterling Precision. Weight of slide rule and case together is 7 ounces. Estate sale find. No dates that I can see, only patent numbers. Leather case in good condition showing normal wear. The slide slides nicely in both directions. The viewing window slide had repairs in the past (shown in the photos) but also slides up and down and stays put. Keuffel & Esser CO., N.Y. Patent Date Dec. 22, 1908. Slide Rule. Original case is included but it is missing the snap. 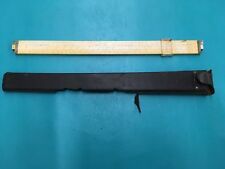 Dietzgen N1733 10" Slide Rule. Dietzgen N1733 - Polymath Multiplex Decimal Trig Type Log Log. 1942 K&E BookLog Log Duplex Decitrig. The Log Log Duplex Decitrig Slide Rule No. 4081 A Manual. Dietzgen Leather Case. VERY COOL. LOCATION-- box ( large BLACKSTAR in brown roll up Position # 1 ). YOU ARE CONSIDERING THE ITEM SHOWN IN THE PHOTOS ONLY. but I have many others listed NOW. This slide rule and case are used as you can see in the pictures. The plastic on the sides of the cursor is cracked as you can see in the pictures. K&E polyphase slide rule with box no leather case n4053-3sl. Condition is Used. Shipped with USPS First Class Package. Keuffel & Esser Co. The green outer box has lots of wear. The case has minor discolorations at the corners, edges and on the snap. The flap is cracking. -Photos are of EXACT item for sale. Used condition. Slide rule shows wear for its age. Red/brown spots are on one side of the rule (see picture #7 – I did not attempt to clean this). There is also, what appears to be, a fine vertical hairline crack on the letter "A" of the word patent (see picture #3)– however, this does not affect functionality. Keuffel & Esser. Set of 2 different K E slide rules with cases. See pictures for more details. Set of 2 Slide Rules. Slide rule and case are in very nice used condition. VERY COOL. LOCATION-- box ( Luray Chipped banana box White Sleeve # 13 ). From a large collection of slide rules and triangle rulers. LOCATION-- box ( big blue plastic tub LIGHT BLUE # 11 ). I try to show any problems if their are any, but look close at the pictures. VERY COOL. but I have many others listed NOW. LOCATION-- box ( SLIDE Cut Box in white roll up, position 19).